Regarding StartupProject with macOS (10.13.6) I do not understand what is going wrong. It looks strange as device is well selected after double-click ; device.name value corresponding to the selected row. NB : my 3 metamotion-R are running with version 1.4.2 and are running perfectly with iOS 12. Add error handling to the async task and post the returned error. Code is exactly the same in repo from github. Does it works for you ? Use continueWith to proprogate errors. Monitor the BLE activity on macOS and post what the BT radio is doing when calling connectAndSetup. Otherwise I have tested it again and with old sdk I do confirm that it works perfectly ; I mean connection and déconnection with led effects (green and red). No, monitor the BLE activity i.e. what the BT radio is doing and what data is being exchanged between the device and mac. What macbook model and OS version are you using? Are you using an external BT adapter or the integrated radio? I work on a macbook air with High Sierra 10.13.6. I am using internal BT radio. Hi Eric, I do not have any sniffer dongle to capture BLE traffic with wireshark. Internal or external BT ? Both are not working the same way ? What would be the minimal hardware and software configuration for mac OS ? It looks better as "connecting" appears in the selected row but it is still impossible to connect and put led on. 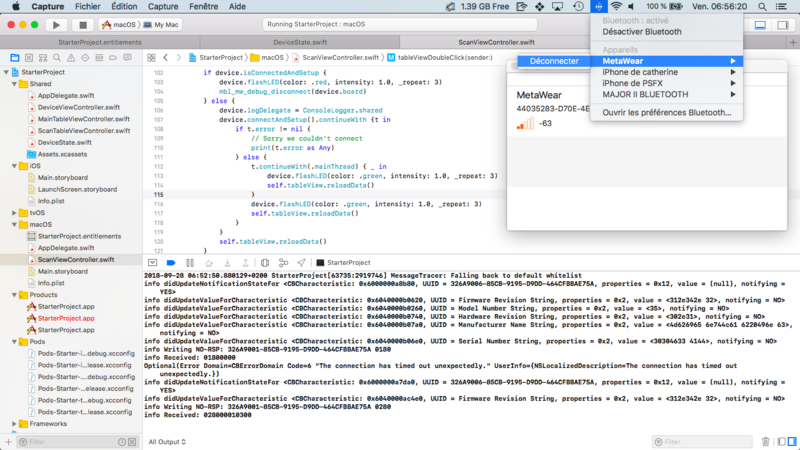 In parallel, so as to check my macbook bluetooth adapter, I made some tests with my Marshall headphones Bluetooth 4 with aptX, and everything is running very well ; with the internal as with the external usb BLE adapter. The only real big difference is the range which is really better with my usb external adapter with dedicated antenna (talus class 1 adapter )... and this is what I am looking for with my Metawear-R. Otherwise, as StartupProject doesn't work (at least for me...), did you plan to push on App Store a full MetaBase app available for mac os that I could download to compare ? 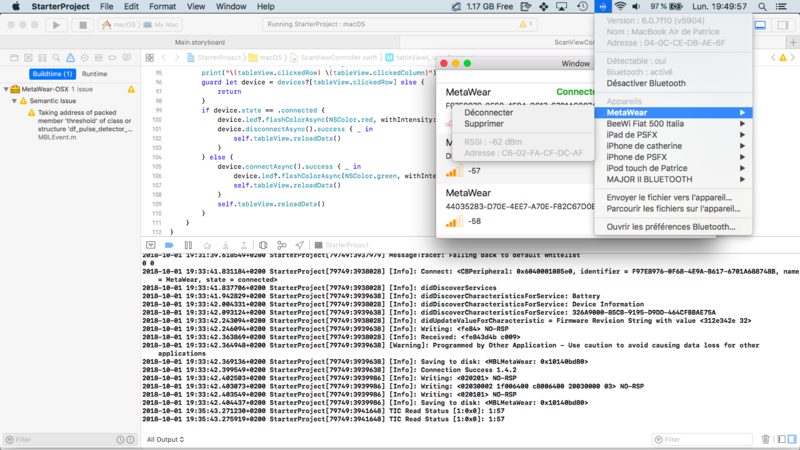 Start with a simple macOS application that uses CoreBluetooth to connect and discover BLE services. Test that your app works with your MetaWears. No, there is no plan on releasing a macOS version of MetaBase.